Development is underway on an ultramodern, multimillion pound build-to-rent development on Forth Banks in Newcastle – the first of its kind in the region. Over £30m been invested in the development called The Forge, which will bring the fast emerging concept to the North East, creating 283 purpose-built rental apartments. Build-to-rent is still a relatively new concept to the UK but is already popular in the US, Germany and France. It offers those seeking a high-quality rental with a professional landlord and flexible lease terms. Spanning over 200,000 sq. 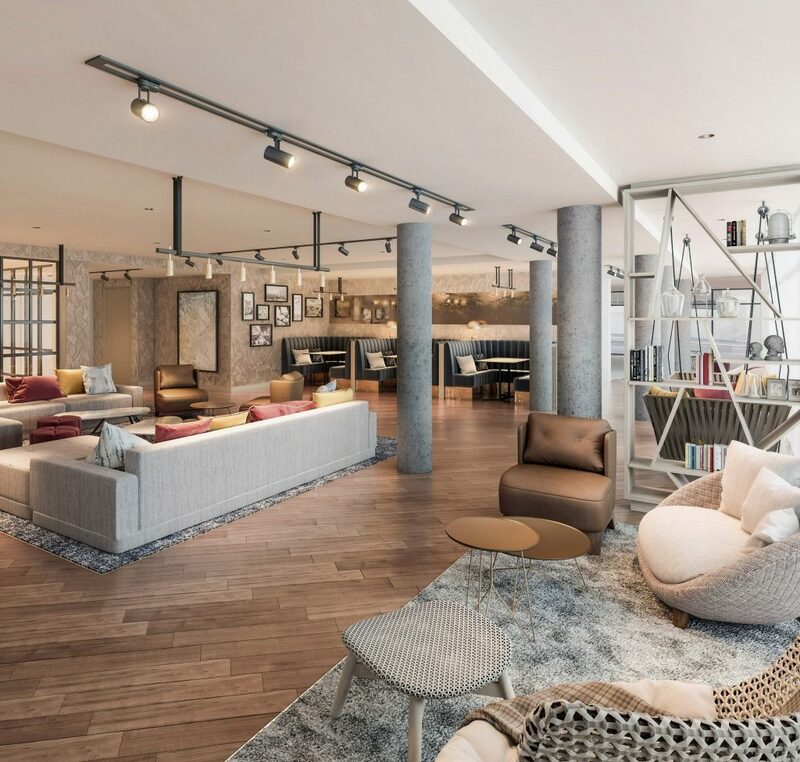 ft. at the heart of the Stephenson Quarter, The Forge is being delivered by Moorfield Group and will comprise one, two and three-bedroom apartments boasting unrivalled facilities and amenities, professionally managed by leading UK property consultant Allsop. It will be set across three apartment blocks; the first of which is due to complete and be ready to move into this summer, followed by blocks two and three later this year. Each interior designed apartment, available either with or without furniture, will have a bright and contemporary open-plan layout, while some apartments will also feature a balcony. Manchester’s award-winning interior design practice KONCEPT ID has helped to bring the same vision to life within the shared spaces to stunning effect. Ultrafast fibre optic broadband will be available throughout the property and residents are able to take advantage of facilities such as a fully equipped gym, studio space for fitness classes, a club lounge with workspaces and cycle storage racks. Notable added lifestyle perks include a 24-hour concierge service, security and a social programme as well as pet friendly apartments available. A tech-first approach will mean the whole letting process can be completed online through Virtual Agency, a revolutionary portal facilitating virtual tours and allowing applicants to book viewings, reserve a property, make payments and sign and complete all documentation. There are opportunities for local businesses as the on-site team will host regular events in the development’s private dining and event space, welcoming everything from beauticians to pop-up bars. Retail space of approx. 3,000 sq. ft. on the ground floor is currently on the market. Helen Douglas-Teggart, lettings manager at the Forge says: “The Forge will introduce a professionally managed, purpose designed, top quality rental offering to Newcastle. We expect it to appeal to a range of residents from young professionals and couples to graduates and families with young children, as it’s flexible and offers a great lifestyle with hassle-free living. “As part of our quayside living model, The Forge will establish a community and embrace Newcastle’s business scene, working with all industries from hospitality to retail to deliver pop-up events exclusive to residents. We’re excited to provide the perfect base for city dwellers to reap the benefits of long-term, convenient renting. For more information on The Forge visit https://the-forge-newcastle.co.uk, email enquires@the-forge-newcastle.co.uk or call 0191 917 1960.